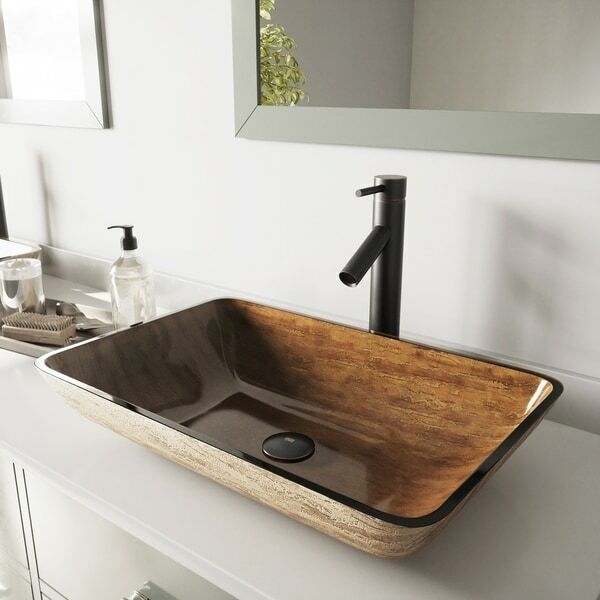 With its beautiful amber hues and high-quality functional design, the VIGO 22 inches Rectangular Amber Sunset Glass Vessel Bathroom Sink is sure to raise the bar in any bathroom. This large, handmade bathroom sink is crafted from durable, solid tempered glass, creating a strong sink that stands up to everyday use. Set comes complete with the VIGO Dior Vessel Bathroom Faucet in antique rubbed bronze finish, matching pop-up drain and mounting ring. Height (when closed): 8 3/8"